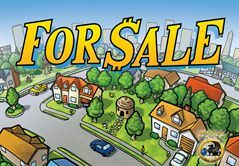 Bid and bluff your way to purchase the most valuable real estate for the lowest amount of money, then turn around and sell those houses (and shacks) for cold hard cash. Be the richest mogul at the end of the game to win this Stefan Dorra classic, which will be released in January of 2009. Considered one of the finest bidding games of all time, For Sale has a devoted following of fans that is about to grow much larger as FRED Distribution publishes the newest edition of this game as part of its Gryphon Games series. Going once! Going twice! Sold to the highest bidder! In this perfectly-crafted bidding game, players are forced to make a multitude of difficult decisions every minuteâ€¦and thatâ€™s just in the first phase of the game! Perfect filler game. Can be played in 15 exciting minutes. Two phase auction system is easy to learn, but offers interesting strategies and variety. For Sale should be in every gamers collection. This is another great filler game. I don't think I have every played this just one time. This is a game that is easy to teach but difficult to master. Keep this one close at hand during every game night. One of the quickest games to learn! I've had great success playing this with casual gamers and intense Euro-only gamers. The game is brilliant in its two round design: the first round - accumulate property. The second round: Try to sell it for the highest payout. The result - a quick - and fun game! This is a great, quick card game. I love the intense bidding when a good property like 28-30 comes out. The game stays fresh because you deal a card for each plaer to go in the middle for the bidding. Sometimes the numbers are close, sometimes spread out so you never know how much you might need to spend each round. In the second pahse I love the simultaneous reveal of the properties and the inevitable "I thought you were going to play your big one" or "I should have gone with my other property." It's just such a fun game that is quick to play and interactive. My friend's young daughter likes to watch us play because she enjoys all of the different artwork for the houses. Often she is rooting for someone to get a certain house. Family fun! If you need a quick filler game that is easy to explain, quick to play, and fun to experience, this should be high up on your list. The two distinct phases of this game are very interesting and make for some tough decisions. How hard to you try to get the premium property? How much money do you need to keep? Can you get the other player to bid just once more? Then, how can you best out-think your opponents to turn your properties into quick cash? This game lets you try to read your friends, while you try to figure out the best way to maximize your money and property. Very fun game! Another quick one, but a really great one. I'm a big fan of both auction mechanics and blind bidding, so it's an unsurprising winner. It's also simple enough to play with non-gamers but has a lot of clever tactics and the art is beautiful.